Presspop Cap - Presspop inc.
It’s been a long time since the last one but here’s our new logo cap! 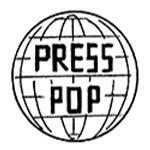 The “Presspop” logo is embroidered using glossy thread. Limited to 10 each of navy and red. We really like how it came out and we hope you do, too!